Now more than ever, folks like you and me have to step up and take a stand to protect and preserve our environment (and, quite honestly, our species). One great way to do that is to incorporate renewable energy technology into projects that use electricity. Even if the environmental aspect isn’t enough to get you on board, you should still use renewable energy tech because the simple truth is that eventually we will run out of coal and natural gas. Besides, renewable energy tech is cleaner and more cost-effective in the long term, AND it means that you rely less on external sources for electricity — super handy in case there’s a severe storm or a solar flare that temporarily knocks out your local power grid. First of all, what is renewable energy technology? Basically, it encompasses any technology that generates (electrical) energy from effectively renewable sources. For example, from our perspective, the sun is essentially an infinite power source since it will be around long after we are gone and produces more energy than we could possibly hope to consume in our lifetime. Coal and natural gas are NOT renewable because they are finite, meaning that there is only so much of it available for us to use. Once we’ve used it up, we’re pretty much sh** out of luck, as the saying goes. Now that I’ve convinced you it’s a good idea to use renewable energy technology, what are your options and how do you actually go about incorporating them into your projects?? Well my friend, read on to find out! This is by no means an exhaustive list, but it does cover the most common and easily accessible types of renewable energy tech. Also, this guide assumes you have a basic knowledge of electronics, so please ask if there is a term or concept that you’re unsure about and I’ll be happy to expand or provide you with more thorough resources. Happy building!! Solar panels are awesome! I put these first because they are one of the most common and, in my opinion, the easiest to incorporate into all kinds of different electronic projects. Solar panels convert incident radiation (aka sunlight) into usable electrical energy via the photoelectric effect. Basically, a photon (light carrier particle) knocks into an electron and transfers its energy to the electron. By making solar panels out of special materials called semi-conductors, one with extra electrons and one with missing electrons (aka “holes”), the free electrons are attracted towards the positively charged material (and repelled by the negatively charged material). When an external load is connected across the solar panel, it creates an effective current. Since the current output depends on the amount of sunlight hitting the panel, the highest power output occurs when the panel is in full, direct sunlight (and is free of dust and debris). 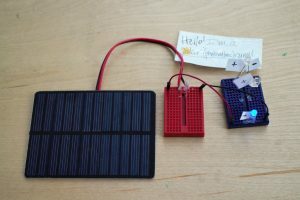 First, solar panels output Direct Current (“DC”), which is ideal for computer/microcontroller projects. For household applications, you’ll need an inverter to convert the DC voltage into AC. Second, since we’ll only get energy generation during the day, we’ll (most likely) need to use a rechargeable battery to store the energy for use at all hours of the day and night. Calculate the battery capacity that you’ll need by multiplying the electric current consumption of your project by the number of hours it will be on and consuming power without any external charge. For example, if my project consumes 0.20 mA of current and I want it to be able to provide power all night (~ 12 hours), I’ll need a battery with a minimum capacity of: 0.20mA * 12 hours = 0.0024 Ah (2.4 mAh). Also, the battery voltage needs to be lower than the solar panel voltage for current to flow from the panel into the battery. 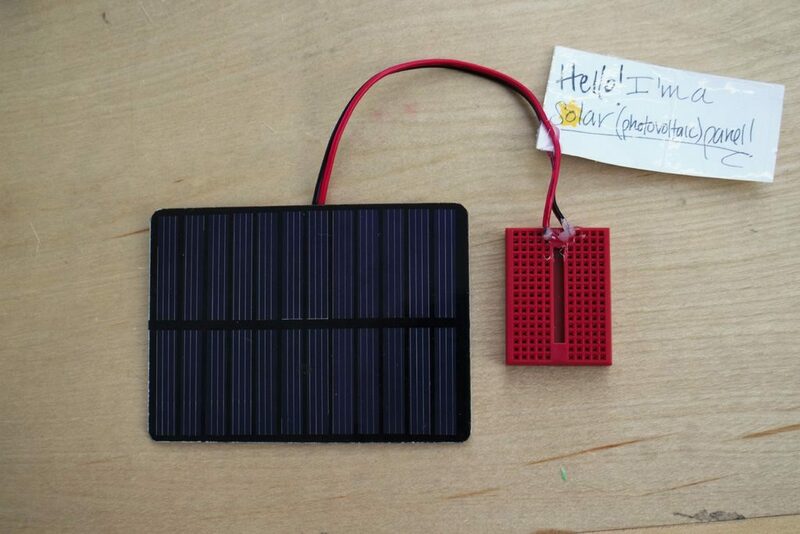 Third, use a diode for trickle charging or a charge controller for higher power applications to protect the solar panel from backwards current flow. Finally, to choose the right sized panel, figure out how much power your project consumes (P = I * V) and pick a panel within a reasonable range. For example, the power consumption of a 5V, 0.50mA microcontroller is 0.0025 W, so a panel between 1W and ~ 7W would be more than sufficient. For larger power panels, be sure you have sufficient circuit protection to avoid blowing out your microcontroller or other electronic device(s). For more information, here is a helpful guide. Wind and water turbines use pretty much the same mechanism to generate electrical energy, so I lumped ’em together. Of course, depending on what medium you’re using, you’ll want a different turbine size and shape. Turbines are a mechanical device that rotate when an external fluid passes through the blades of the turbine, whether it’s water or wind (whoa what air is a fluid?! yes, yes it is :D). The turbine is connected to a drive shaft that spins an electric generator to produce electrical energy. Turbines are location dependent, so first you’ll want to figure out if it’s feasible: Do you have a stream, waterfall, or other moving water source nearby? Does the location of your project get steady wind? If you have a moving water source, water turbines can be purchased rather cheaply. Here’s an example of a 12V water turbine for use in a garden. 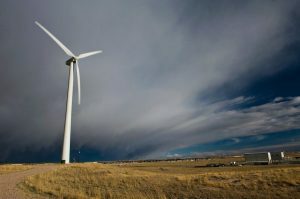 Wind turbines can be tricky to install, since the wind might change orientations annually or even daily (which is why wind farms have them facing different directions). Wind turbines also tend to be more expensive. The plus side is that pretty much every location gets *some* amount of wind. Here’s an example of a small, somewhat inexpensive ($50) wind turbine, and here’s a more expensive 400W wind turbine ($400) that could power large appliances. There are TONS of different types of turbines, so do some research and find one that suits your needs and budget. Turbines also output DC current, so you’ll need an inverter for household appliances. As with solar panels, you will likely want a rechargeable battery to store the power for use anytime during the day or night, regardless of weather conditions. Calculate your needed battery capacity using the same method as for solar panels. Use a diode for low-power projects and a charge controller for larger projects to protect the energy generator from backwards current flow. Determine the power output for your turbine by calculating the power consumption of your project in the same way that’s outlined for the solar panel. Here’s a link to more information on wind turbines! Thermoelectric generators (“TEGs”) are super cool, but generally have a very low power output. That said, they are not weather dependent, don’t have any moving parts (aka are essentially maintenance free), and are very reliable. 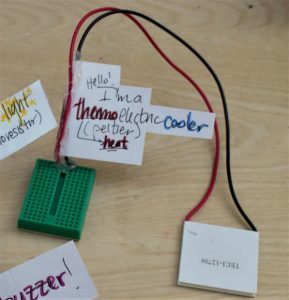 Thermoelectric generators can be super handy for small projects like charging smartphones or powering LEDs. Ok, so these things are somewhat complicated — basically, special materials with high electrical conductivity and low thermal conductivity can generate an electric current when there is a temperature gradient (aka a temperature difference between one side and the other). So if you heat one side of the thermoelectric generator and cool the other side, a current will flow. It also works the other way around — if you apply a current to the generator leads, it will cause one side to heat up and the other side to cool down. 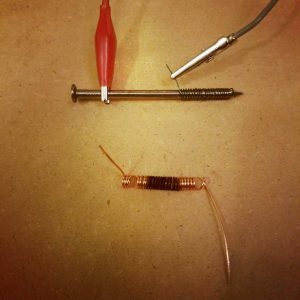 A super simple thermoelectric generator is shown in the photo above: a junction of two different metals (copper and iron) is heated to produce a current output between one end of the copper wire and the head of the nail. It’s too little current to be of much practical use, but it’s a great educational project! Another DC electrical energy generator! Get at those inverters for AC power applications. Since these are super low power, I’d suggest a rechargeable battery just like with solar panels and turbines, and maybe even an amplifier like a transistor. Since these will likely stay low power, you shouldn’t need a diode to protect the TEG, but be sure to have adequate circuit protection for your particular electronic load. You can purchase TEGs that have specific power outputs, typically for camping purposes, or you can rig up your own using peltier junctions. Consider connecting a few in series to get a higher energy output. Here’s a great overview on how TEGs work, check it out and be inspired! Ok, so that’s it! We’ve covered 3 of the primary renewable (and clean) energy technologies! There are TONS more out there but they are either 1) super involved, 2) super expensive or 3) both. Here are two of the more common ones to give you a sense of what is possible in the wonderful world of renewable energy technology! 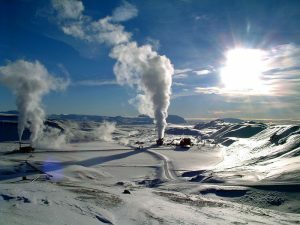 Geothermal power plants use hot water deep in the earth to run a steam turbine. This requires ridiculously deep wells (~ 1km) to pump up the hot water, run it through a heat exchanger (or directly through a steam turbine if you’re lucky enough to be close to a water source that hot), and then push the water back into the earth or let it seep back down naturally. These are super cool because there are no negative consequences of energy generation — no pollution is generated (only steam! ), no water is lost, and it the water will heat back up naturally over time. These are a bit controversial due to the radioactive waste byproducts of nuclear fission, but nuclear power plants do in fact generate renewable, clean energy. As long as the waste is properly stored and there are safeguards in place to prevent meltdowns, nuclear power plants are relatively safe and well understood. Currently, nuclear power plants use the process of fission, which involves breaking up an unstable atom (e.g. uranium) to get out high energy electromagnetic radiation (aka light). That energy is usually converted into heat and used to run a steam turbine. Ideally, we’ll figure out fusion somewhere in the near future, which is the process of fusing two simple atoms together (usually two isotopes of hydrogen). Nuclear fusion generates electromagnetic energy and inert particles like helium. This is what stars do! Except they are much, much more efficient as they are insanely hot and high pressure. Fusion does NOT produce any radioactive waste, so it would be a perfect solution to our energy crisis. Now to just figure out how to get a net positive energy output…. For more info on fusion, check out this awesome article by the folks at Industrial Quick Search Directory. Now you know what renewable energy technology is and, generally speaking, how to incorporate it into your personal projects. 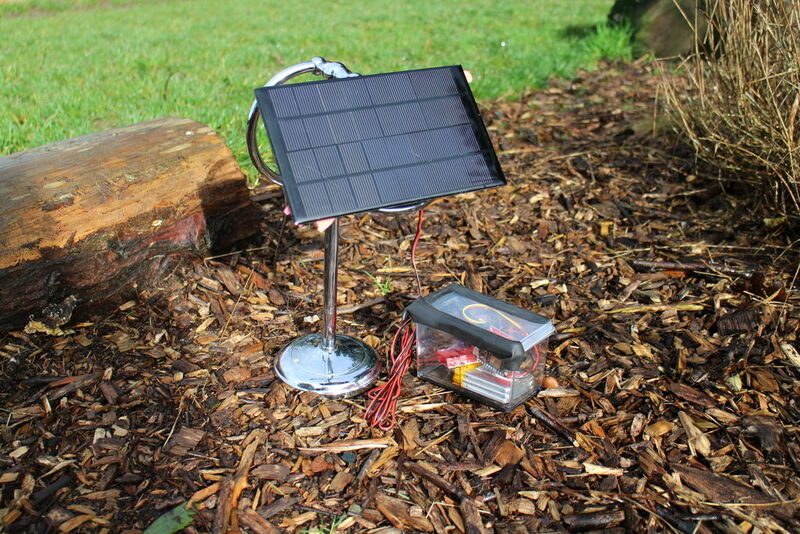 It’s also a great way to charge your gadgets while out and about, make your projects portable, and have a backup power source in the event of a power outage. Please feel free to ask any and all questions! My goal with this is to empower you to feel confident in using some sort of renewable energy tech in your everyday life, whether you purchase it or build your own. Remember, it’s ok (and encouraged) to start small and simple! 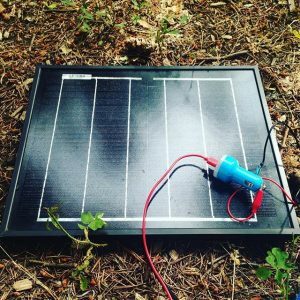 Use a solar panel to power a small motor, use a wind turbine on your bike helmet to power a bike light, or use a thermoelectric generator to light up some LEDs while camping! If this tutorial inspires you, I’d love to see any projects you made, share ’em in the comments below!! ← Build & Play Robot Mini Golf!